Showman Aluminum Twisted Stirrups W/ Painted FOLLOW YOUR DREAMS Design! TACK! 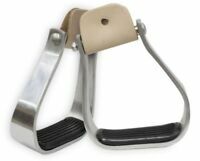 Showman Angled Off Set Western Aluminum Stirrup W/ Removable Rubber Tread! TACK! Showman Rawhide Covered Western Saddle Stirrups With Leather Lacing! HORSE TACK! Showman MEDIUM OIL Leather Covered Western Roper Style Stirrups! HORSE TACK!